New Orleanians could see clearer laws about the placement of ladders, more control over the locations of portable toilets, and more efforts to clear public spaces during and between Mardi Gras parades next year, based on a number of ideas Uptown residents discussed with their City Councilwoman on Saturday afternoon. The city already has laws governing parade-route conduct, but a lack of enforcement over the years has meant growing encroachment of shared spaces by “homesteaders,” as some Uptown residents called the people who stake out large areas of the sidewalk or neutral ground, roping off areas, erecting tents or creating a wall of ladders along the curb. City Councilwoman LaToya Cantrell agreed with those residents Saturday that she would support more citations for violators, but the bulk of the discussion was on ways to increase voluntary compliance — leaving police to the more important public-safety functions like taking guns off the route. Creating a fixed distance between ladders and the curb. Current law says ladders must be placed back as many feet as they are tall, a standard that literally changes from ladder to ladder. Residents said one fixed distance would be easier to understand. Signs showing that distance. If signs reading “No ladders beyond this point” were affixed along the route, people bringing ladders would know better where the line was, and other residents or police would have an easier time pointing it out to them. Holding toilet companies responsible for the burden for illegally-placed portable toilets, such as on private property they don’t own or public property. If the companies stood to risk a fine or impounding when residents bring toilets in the back of pickup trucks, for example, they would find ways such as high security deposits to keep renters from losing them. Creating more public places to go to the bathroom. The city could provide more, as it does on Napoleon Avenue. Fixed-position vendors could be given permission to bring them and charge for their use. Schools and churches could be given greater incentive to offer their own facilities. Residents agreed that more places for parade goers to legally ‘go’ are needed. “If we don’t provide that, then they will find an alternative — which is your lawn,” Cantrell said. Disposing of furniture and other items left on public property after parades. City workers could collect ladders, tents and other objects abandoned overnight when the street cleaning begins, residents suggested. Resuming normal street car service quickly after parades. When the streetcars stop, people quickly set up tents and grills on the tracks. Cleaning the neutral ground would allow the street cars to run and keep the areas clear. Some residents even suggested keeping the streetcars running during parades for the same reason, but Cantrell and NOPD officers present said that would likely pose too great a safety issue. Making both sides of St. Charles a “no parking” zone during parades. Currently, parking is allowed on the Uptown-bound lanes, making that side fairly narrow. Resident Susan Muchmore suggested that if that parking lane was kept clear, emergency vehicles could get through much more quickly on the wider lane. “People have no place to go,” when a vehicle is trying to pass, she said. “They’re up against cars.” Less parking on St. Charles might also discourage some of the larger installations of furniture, residents noted. Saturday’s meeting was an informal brainstorming session, with none of the ideas adopted or acted upon. Cantrell said they all merit real consideration, however, and promised to explore each of them with the appropriate city agencies, the draft a list of those that may be possible. From there, she said, she’ll introduce an ordinance to the City Council, and will count on her constituents for their support. To read our live coverage of Saturday’s meeting, see below. They cleared out the problem with Amelia on the lake side of St. Charles, but those kids just came across the street. I had to place an employee at my locked gate to stop the kids from climbing over to urinate in my parking lot. Instead they just urinated all along that first block off St. Charles. They left a huge pile of trash that was not picked up for a week. I bothers me to see people patting her on the back for clearing up that problem when it just migrated! Too bad you were not at this meeting, as this and many other problems were discussed- and possible solutions were suggested. Yes and sorry the Amelia problem just migrated to your side of the street, but what if any suggestions do you have for long term fixes? Sorry to sound so defensive. Those kids made what was already a stressful several weeks even more stressful. I was happy to see the police clear out the problem area. The frustration came when I realized not only had the kids migrated, but the police were doing nothing about it. It seemed that as long as they were no longer in the exact area that was on the radar of the city council it was no longer a problem. We dealt with the issue as it was happening. I was really annoyed after Mardi Gras to hear the issue addressed as solved. The party was not broken up, it was just moved across the street. Do we get the police presence and spotlights next year? 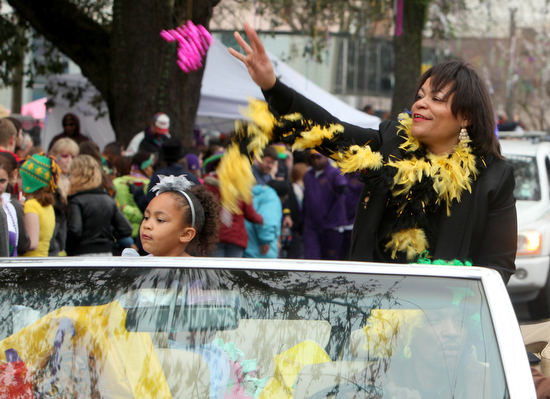 how about moving some parades BACK to the Mid City route? Why does EVERYTHING HAVE to be on st. charles? Ladders are OK, they are for children. And adults can still see and catch throws from behind. Tents should be outlawed, they take too much space both front and back and do not allow for movement. More routes will lessen reliance on the Napoleon/St Charles corridor. One complaint that I have voiced before and will voice again is noise pollution coming from vendors set up near the parade route. Annoying DJs in love with the sound of their own voices as they hawk beer need to be shut up. Let us listen to the marching bands in peace! It would be nice if this did anything to solve the problem, but does anyone really think the problem with the ladder-wall d-bags is that they just don’t understand the rules? My experience with “pointing it out to them” has been that they’re perfectly aware of the rules, they just think the rules don’t apply to them because they’re special. Most of these sound like common-sense suggestions, which makes me wonder why they would be opposed by council members or parade goers? Would also love to see some more diversity on routes as well. I live in the suburbs, and did not know about this meeting. But in reality this is a problem in mid-city for Endymion and uptown, specifically Napoleon, for Bacchus Sunday and St Charles for Mardi Gras Day. The ladder distance thing is easily if it’s enforced… lay the ladder down… that’s far back it has to be from the curb. Signs would work but that takes time, cost, and takes up space. I think it takes a few simple rules. As far as enforcement, maybe they can redeploy the meter maids. 1) No ground tarps, no tent stakes, no ropes, no spray-painting of boundaries on the grass. 2) No unattended items. If you want to bring a bunch of ladders and chairs out the night before and sit out with them, then that is fine and actually part of the fun of Mardi Gras. But dropping things off a day or two before the parade, and showing up two hours before the parade rolls has got to stop. If the owner of stuff can not be identified in 20-30 seconds, call in a dump truck. 3) Ladders must have a “seat”. No adults standing alone on ladders. No ladders over 6-7 feet tall. If everyone had just a small amount of decency, these rules would be unnecessary. And 90 percent of people are good and decent. 10 percent of people get caught up in the “all for me” mentality, which is a shame. You mean the rude and obsessive people who show up on Lundi Gras night to stake out literally 1/3 to half a city block of neutral ground between Lee circle and Jackson are finally going to be dealt with? In some cases setting up 30-50 folding tables and rope to block people out of their “turf”. They’ve been doing this for 25 years…Ill believe it when I see it! Another huge problem is the morons who actually park in the travel lane on St. Charles Ave and just sit in the car blocking traffic. Where is traffic enforcement?? Ive never seen them writting tickets on St.that stretch if St. Charles EVER!! !